Every time you share this website with your friends, you get one entry into a drawing to win a print of your choice (any image, any available size) or a $100 gift certificate towards a custom painting. 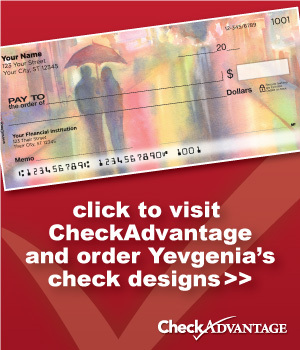 In order to be entered, email me the links where you shared the website to: info@yevgeniawatts.com. You can also use the contact form on this website to do the same. Word of mouth counts, too. If you tell a friend about me and they send me an email mentioning you, both you and the friend receive an entry into the drawing. When you sign up for email updates, you get one entry into another drawing for an 8x10" (matted dimensions) print of your choice. All existing subscribers are entitled to one entry. Enjoy FREE shipping on everything on this website through the rest of May! Both drawings will be held on June 1, 2011.